It’s here…your dose of serenity in the midst of the holiday shopping season. 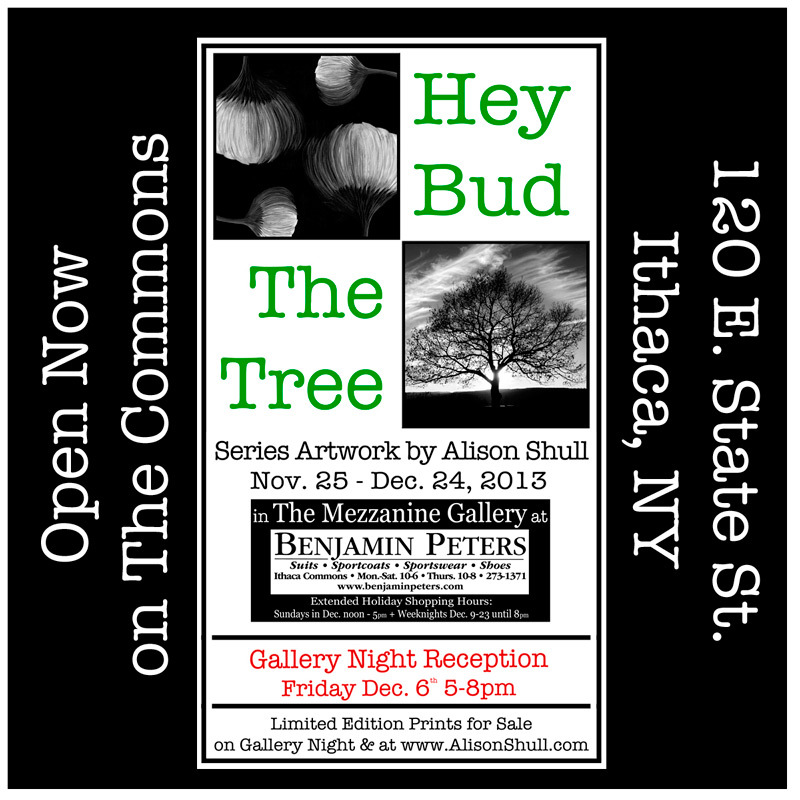 “Hey Bud, The Tree” my new Series Artwork Show is open now through Dec. 24th at the Mezzanine Gallery in Benjamin Peters, 120 E. State St. on the Commons in Ithaca, NY. Photography, painting and design inspired by an iconic Ithaca tree in dynamic Ithaca weather…and an 85 year old wish. 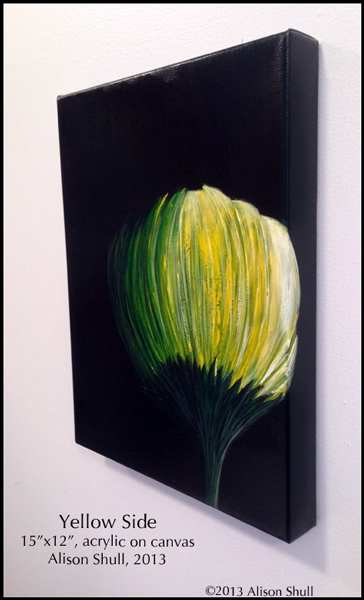 The bud begins as a painting, the tree as a photograph, then natural and artist-made change happens. Same bud, same tree, different flavors. with refreshments by Blue Wave Pastries – yum. Limited edition prints of each piece in the show are available for purchase during the reception and any time at my on-line gallery. Prices range from $29 – $89 (ooooo, now you’re thinking “creative and affordable gifts”). Place orders on-line (www.alisonshull.com) or via email (info@alisonshull.com) or regular mail (use these handy forms: HeyBudSeriesOrderForm, TheTreeSeriesOrderForm)). Remember to arrange for local pick-up, or shipping to the lucky recipient(s) of your generosity. And for bud lovers, you can also order blank greeting cards in a bouquet of colors (made from the same original bud pictured below). Wishes like Jane and Jared’s lead me along creative paths. After completing the bud painting I was looking over photographs of the tree at Sunset Park that I’d taken over several years. I began to see more images evolving. Using digital painting and collaging techniques, I created these two series iteratively and in parallel. Now you can see more images too. For me, these images reflect the dynamic nature of life. Combined here in the show they serve as a tribute to the pursuit of Jane and Jared’s wish in the midst of change, both real and imagined. A few years ago artist Alison Shull wrote a little poem about her art. Are you too astonished at how aptly it now describes this show? Previous AlisonShullArt: Oct. 2013 Social Media..what, you missed it?